In late 2014, the Club welcomed St Catherine's School, Waverley to our new world-class clubhouse, as our in-house school partner. The club has developed strong relationships with many Sydney-based rowing schools, acknowledging the important role school-based rowing programs play in developing future generations of elite level rowers. However, deeply partnering with an independent girls school's rowing program - by sharing our world-class facilities, and enabling access to our athletes and expertise - is an important strategic and community objective of the Club. St Catherine's is a relatively young rowing school, having started rowing in 2012, however is already making impressive progress against more established rowing schools. We anticipate seeing the St Catherine's program continue to develop from strength to strength. 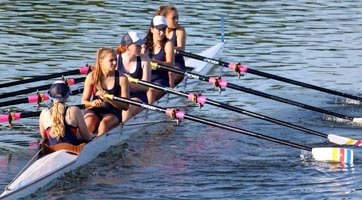 Importantly, St Catherine's rowers become Special Members of the Club - welcome aboard. In the coming years, we look forward to seeing some of you graduating to join our Women's Elite & Development Squad - aspiring to the highest levels of international competition. It's entirely possible. TIP: Observe, ask questions, listen to the answers, and train hard. Welcome also to St Catherine's parents and supporters. We invite you to become actively involved in the Club, as your share in the growth of your daughter's passion for rowing. We also invite you to become a 'Friend of UTS Rowing' and help enable the success of the next generation of our Club Members. Enjoy the early mornings, and thanks for your support.